AMLT – An Open Global Standard For The Transparency Of Cryptocurrencies. AMLT used in the Coinﬁrm AML/CTF Platform is the missing puzzle to bring virtual currencies into the mainstream in a safe, secure and compliant way. It helps exchanges, payments processors, ﬁnancial institutions and all players in the ﬁnancial system to manage the regulatory risk related to blockchain value transfer. It allows network members to provide information, rate other market participants and democratically help determine the related risk to entities and counterparties using virtual currencies. AML/CTF is connected with risk management, not just simply strict laws, rules and regulations to follow. There is also a degree of internal assessment needed by obliged companies to build a correct risk management model. AMLT helps with compliance in an innovative way while by engaging and providing beneﬁcial participation to the users of virtual currencies. AMLT helps market participants access data about the risk related to virtual currencies – use AMLT to obtain reports and to fully benefit from the cryptocurrency economy. It brings efficiency and effectiveness of AML/CTF compliance and democratization for market participants globally. AMLT users will help define good actors and bad ones with precision beyond the reach of the current financial system – without unfairly excluding individuals in sanctioned countries. This solution is needed for entities that accept virtual currencies or simply want to have exposure to it such as banks and financial institutions – they are obliged to understand risks for their clients. A solution is needed for virtual currency businesses and traditional businesses that accept virtual currencies or simply want to have exposure to it. At the end of the day, any entity touching virtual currencies or operating with them needs to apply AML/CTF compliance rules to protect themselves, their partners and their clients from potential risks and to allow for its commercial growth. Any ﬁrm that has a commercial relationship with virtual currency companies also need to understand such risk. Businesses intelligence companies such as Thompson Reuters cannot ignore information about what they have in their portfolio. Any market as large as the virtual currency market and entities operating within it need, analytics and an AML/CTF compliance solution for legal, commercial and moral reasons. The market is global and it is growing rapidly and is no longer ignored by big business, ﬁnancial institutions, criminals, regulators and ﬁnancial investigation units. The solution is here. A global platform that solves these problems for the entire ecosystem in a new, eﬀective and eﬃcient way, that grows with the network it creates and becomes the ‘back bone’ for the ecosystem while running unnotice ably in the background. The entire ecosystem now has a simple and straight forward solution that helps with the compliance for the most sensitive aspect of its businesses. HOW DOES COINFIRM WORK ? Coinﬁrm provides a network that builds a transparent, democratic, eﬀective and compliant virtual currency and blockchain ecosystem. Coinﬁrm’s goal is to deliver a streamlined and eﬀective Global Standard for AML/CTF com pliance in a decentralized and democratic way where participants can provide AML/CTF/Fraud/business/risk ratings whether negative or positive. Not only providing transparency and democratization of the ﬁnancial system in an un precedented way, AMLT attached to the Coinﬁrm AML/CTF Platform serves as a bridge to accommodating new business models and adopting blockchain and virtual currencies. WHO IS AMLT IMPORTANT FOR ? As studies and leaders have shown, Regulatory Compliance, especially Anti Money Laundering (AML) and Counter Terrorist Financing (CTF) for Blockchain and virtual currencies has been a massive roadblock to their overall mass adoption. AMLT provides access to to a secure and transparent blockchain economy – it protects you, your partners and clients from potential risks and allows for commercial adoption and growth. 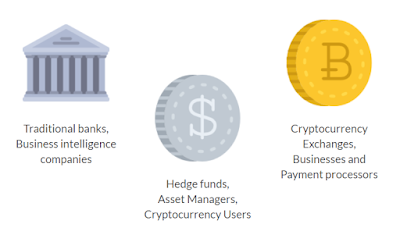 Coinﬁrm’s team consists of professionals and entrepreneurs with vast business and compliance experience, supported by great tech and blockchain specialists. An entrepreneur, recognized AML/CTF and compliance advisor; former head of global AML/CTF processes at major financial institutions such as RBS; a specialist in compliance and anti-money-laundering with extensive experience conducting global projects for international financial institutions and cooperating with supervisory authorities; the chairman of the Compliance Association of Poland. One of the more recognizable fraud prevention experts in Central Europe, former Head of Fraud Investigations in ArcelorMittal, AML/CTF Project Manager in the Royal Bank of Scotland, fraud investigator and auditor in Ernst & Young; holds the titles of Certified Fraud Examiner and Certified Internal Auditor. Creating models and ventures around tech and new media since his teens, Grant has been engrained as a visionary in both California and European startup ecosystems; whether through his own projects or working with major companies. An innovative IT and security specialist, has been analyzing and developing around blockchain, cryptocurrencies and their applications since 2010; the former head of multi-algorithm virtual currency mining farms. An international pioneering virtual currency adopter, involved in the Bitcoin and Blockchain space since the early stages; a recognized author and speaker on the subject and co-founder of the first Bitcoin establishment of its kind in Europe.